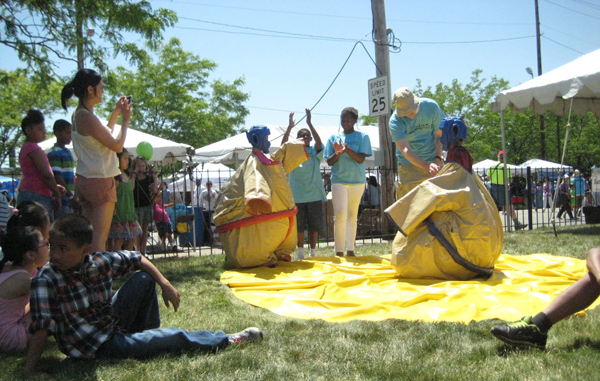 Making its triumphant return to Cleveland, the third-annual Cleveland Asian Festival was arguably a great success. Packing several city blocks, the festival included a wide array of vendors encompassing myriad Asian communities. Attracting tens of thousands of visitors to the Asian Town neighborhood of Cleveland, the festival shined a well deserved spotlight on the region’s vibrant Asian-American community and all it has to offer. With so much to see and do (and, of course, eat! ), it is impossible to sum up everything that the festival had to offer; however, there were several aspects well worth mentioning. Perhaps the best part about such a gathering is that it brings otherwise diverse and dispersed groups of people together. This year’s festival certainly achieved that goal. While many hear “Asian American” and automatically envision someone of Chinese descent, the festival proudly represented all Asian American communities, big and small. Underrepresented Asian nations, such as Cambodia, and those often not associated with “traditional” visions of Asian America, such as India, were placed side by side heavyweights like China and Vietnam. Allowing such communities to showcase their unique cultures was one of the best parts of this year’s celebration. From Khmer cuisine to Indian clothing and dancing, there was no shortage of new and worthwhile things to discover. Another wonderful aspect of this year’s festival was its appeal to those of all ages. Games and photo opportunities for the little ones (and those adults among us who sometimes feel the need to let out an inner child) kept kids entertained, while travel booths, clothing stores, and even body mass index (BMI) readings were available for adults. Other booths offered everything from face painting and shaved ice to fitted bathtubs and electricity (courtesy of Cleveland Public Power). This year’s entertainment also proved to be appealing for all as dance troops and singers of all ages and ethnicities took to the festival’s two stages alongside Instant Noodles – made famous by MTV’s America’s Best Dance Crew. Finally, worthy of note, and perhaps representative of the festival’s overall goal, is that many of the attendees were not of Asian origin at all. Blacks, whites and Latinos all attended and enjoyed this year’s festivities. Attracting such a diverse crowd allows our region’s Asian-American community to reach people who might not otherwise become immersed in it and perhaps teaches and informs as much as it entertains. A quick glance at this year’s program also highlights the fact that this relatively new festival (after all, in human years, it is only a toddler) has caught the eye of political heavyweights from Cleveland to Columbus. Could this signal a shift from a political scene that tends to undervalue or, perhaps more accurately, ignore Ohio’s Asian Americans to one that embraces them and takes their issues to heart? In a state which counts only 1.5 percent of its population as Asian American, that is something only time may tell. However, if the success of this year’s festival and the heart felt and letters written by our elected officials and included in the festival’s brochure are any indication, Asian Americans have placed themselves on the map, and it is unlikely that that is going to change. This year’s Cleveland Asian Festival had everything – food, culture, clothing and perfect weather. Best of all, though, it attracted the diversity that not only makes Cleveland such a great city, but also makes the Asian-American community such a wonderful and vibrant group. Matthew Seymour Teaching in Harlem, Matt is arguably much more American than he is Asian American. Receiving a bachelor's degree in history and social studies, along with his teaching licensure, from Cleveland State University, he enjoys writing about various subjects and exploring the wonders of history.